Robert Habeck, center, and Anton Hofreiter, right, leaders of the Greens, celebrate the results of the Bavaria state elections, Munich, Germany, Oct. 14, 2018 (AP photo by Kerstin Joensson). While much has been made of the rise of the far-right Alternative for Germany, or AfD, party, it was the left-wing Greens that recorded the biggest gains in last week’s state elections in Bavaria. 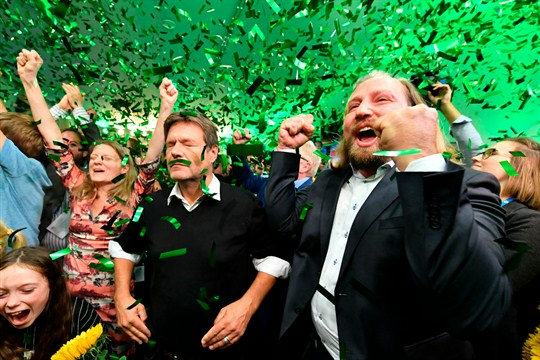 By winning more than 17 percent of the vote, the Greens nearly doubled their total from Bavaria’s last elections in 2013 and will enter the new state parliament as the second-largest bloc.